Say "Edelzwicker" and many will frown. But although most Edelzwicker are wines that are offered on 1-liter bottles almost for free, it is wrong to generalise. Because one can make Edelzwicker in many ways and with varying level of ambitions. At worst, it is hard-pressed must from high yield sites on the Plaine d'Alsace. But better is, if it is done from surplus, high quality must for which the vat intended lacked space, or - as in this case - if it is deliberately made from co-planted grapes, grown in a well-tended vineyard with a reasonable yield. 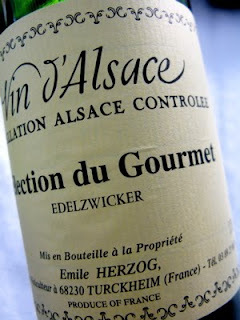 2007 Edelzwicker Sélection du Gourmet from Emile Herzog Turckhiem is made from Chasselas, Riesling, Gewurztraminer and Pinot Gris. The scent is fresh and peppery spicy but also contains green apples, apricot and hazelnut. The taste is clean and fresh with moderate body, youthful fruit and a hint of bitterness (from Gewurztraminer) in the finish. Lovely on the table! Price: € 5.60.